DISCLAIMER: Because the manufacturer cannot control the condition of application, storage and handling practices, no expressed warranty is made. Normal expected results from using this inoculant can only be expected when the application, storage and handling is followed as instructed. Total bacteria, not less than 52 billion CFU/gram. 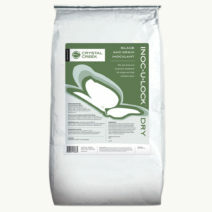 Corn and Sorghum Silage: Incorporate one container (350 grams) of INOC-U-LOCK™ WS to 200 tons corn or sorghum silage. This delivers 100,000 CFUs per gram of treated crop. For smaller amounts of silage, one cup of Crystal Creek’s® INOC-U-LOCK™ WS treats 100 tons. 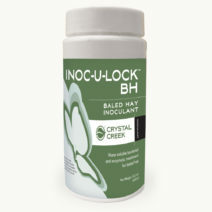 Grass or Legume Haylage and Small Grain Silage: Incorporate one container (350 grams) of INOC-U-LOCK™ WS to 100 tons of grass or legume haylage or small grain silage. This delivers 200,000 CFUs per gram of treated crop. 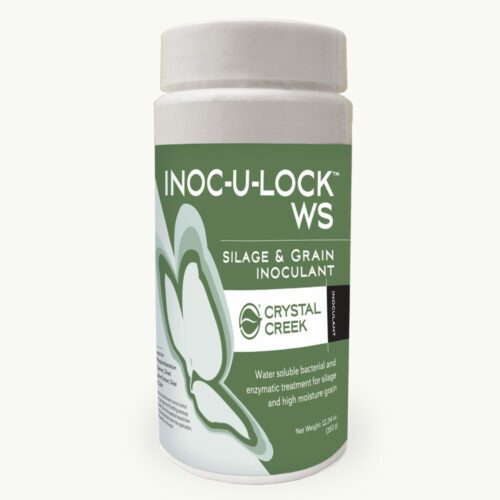 For small amounts of grass/legume silage, one cup of INOC-U-LOCK™ WS treats 50 tons. High Moisture Corn: Incorporate one container (350 grams) of INOC-U-LOCK™ WS to 66 tons of high moisture corn (HMC). This delivers 300,000 CFUs per gram of treated crop. For smaller amounts of HMC, one cup of INOC-U-LOCK™ WS treats 33 tons. Storage: Store INOC-U-LOCK™ WS in dry, refrigerated storage. 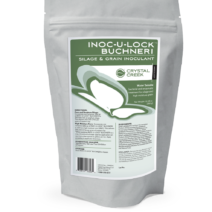 Note: When applying INOC-U-LOCK™ WS to a crop, the amount of water used for application can vary. Apply water volume according to applicator directions.